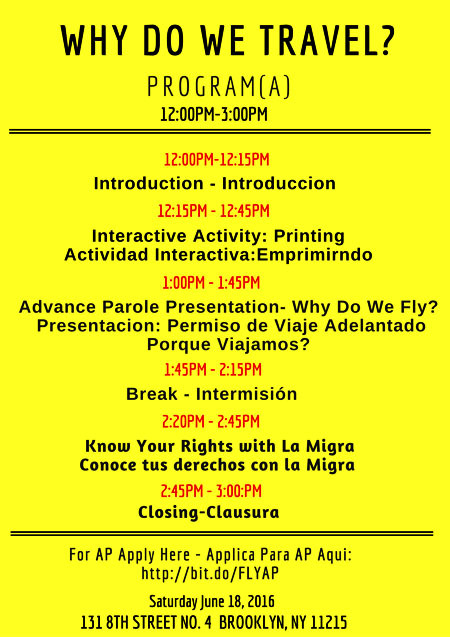 As a collective, we meet every Saturday at Immigrant Movement International (IMI) in Corona Queens from 3-5pm. 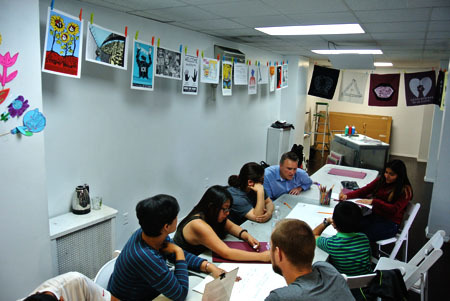 Please email us to join our regularly scheduled workshops, all are welcome. 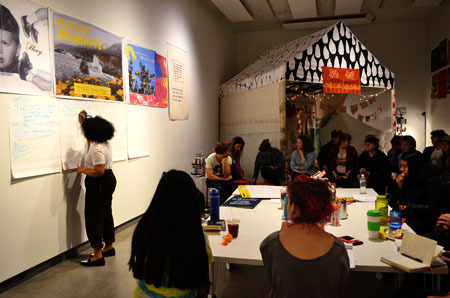 This workshop explored our unique methodology for creating socially engaged art and participatory design. 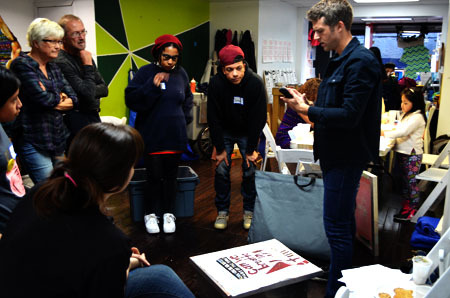 Participants were introduced to our eight principles, their meaning, and how to take that out into other socially engaged work. 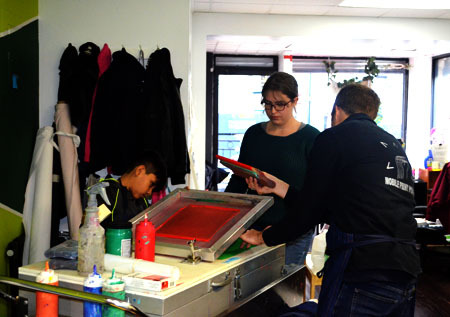 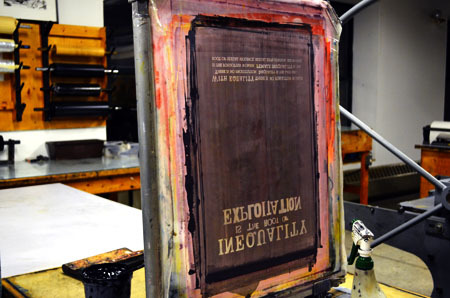 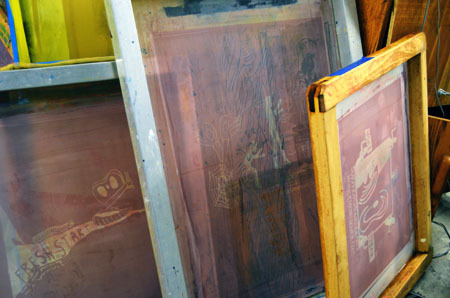 The workshop also included collaborative image creation, silkscreen instruction, and the printing of several new MPP graphics. 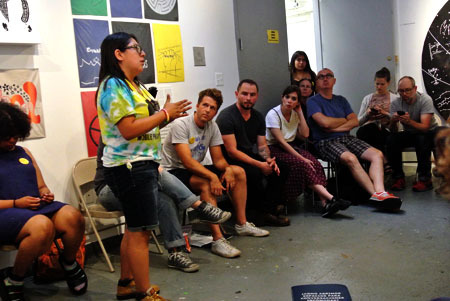 This three-hour workshop took place with women from the group Survivor Speak. 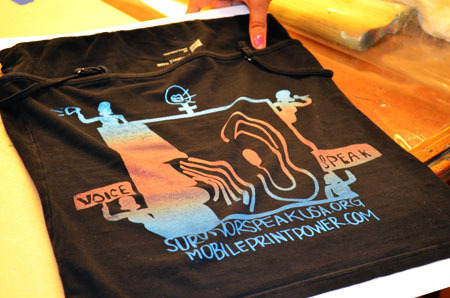 Our goals for the workshop were to learn about the work of Survivor Speak and provide space for connections and conversation. 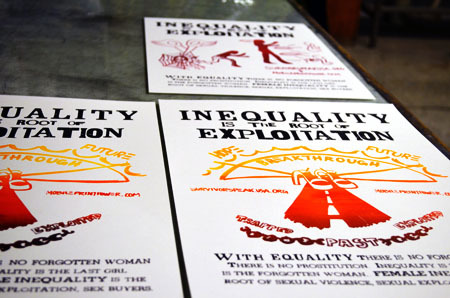 With Survivor Speak, we worked to develop posters to raise awareness around the issues of female inequality, sexual violence, and sexual exploitation. 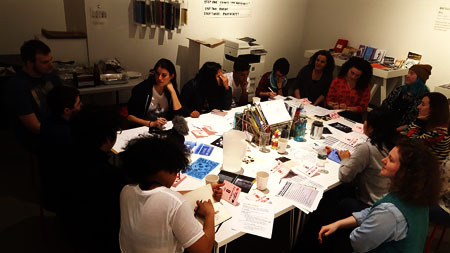 This workshop followed the MPP process from start to finish: beginning with a conversation, question, collaborative image creation, and printing of posters. 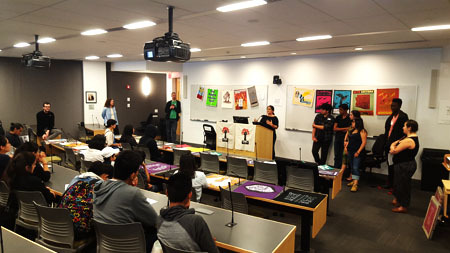 In this workshop, MPP worked with two students groups from MECA to provide examples of how we created our own 8 Principles. 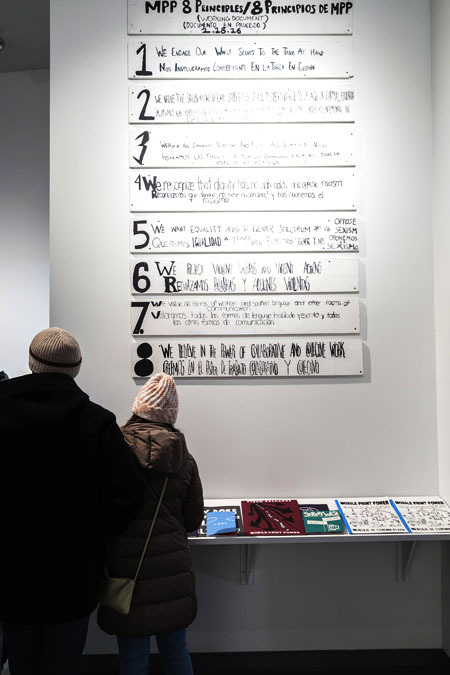 Interference Archive also provided material and background on other group’s own principles, such as the Black Panthers, Young Lords, and Muhammad Ali’s 6 Core Principles. 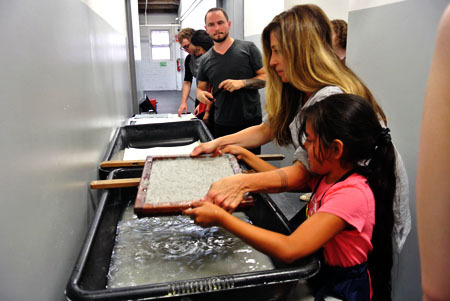 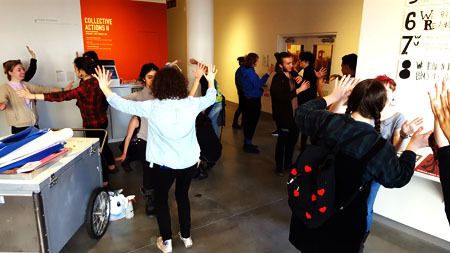 MPP worked directly with a group of approximately 20 undergraduate art students to demonstrate our methods and approach to public engagement. 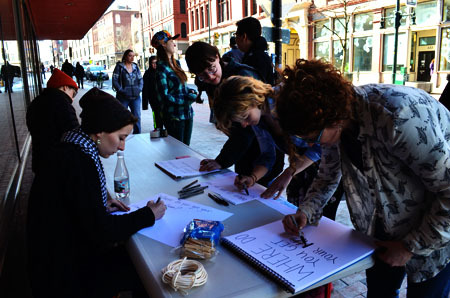 With the students we developed questions that were relevant and critical to both the campus and larger Portland, ME communities. 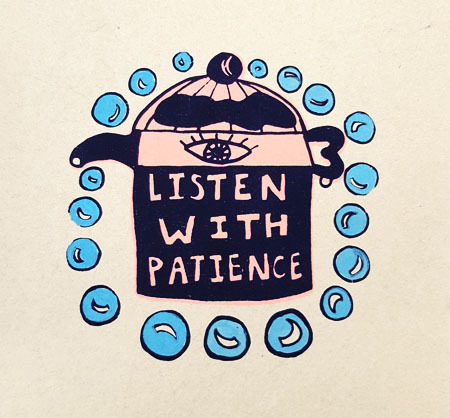 We asked questions such as: What gives us hope and how do we maintain it? 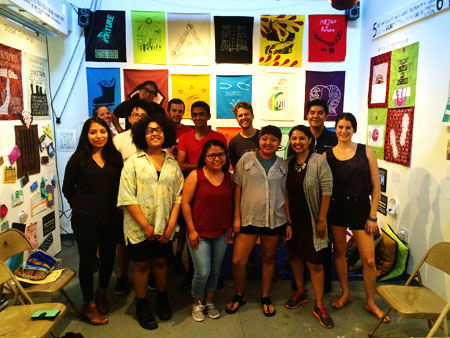 What is home and when do we feel uncomfortable at home? 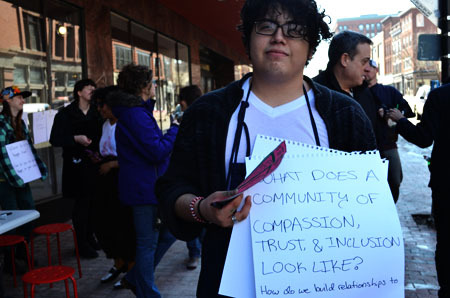 What does a community of trust, compassion, inclusion look like and how do we build relationships to make that real? 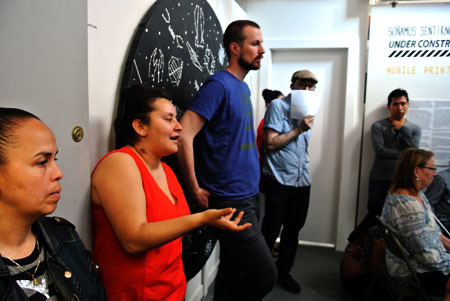 In this workshop, MPP & ELNYA focused on the question "Can You be an Artist Part of the Time?" 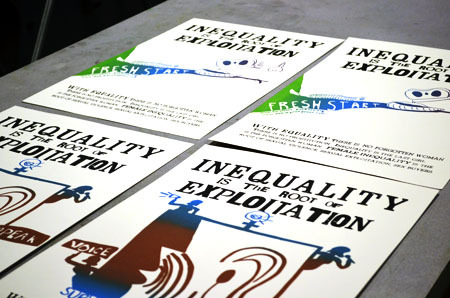 The workshop included conversation, image creation, and printing of MPP's past work focused on this topic. 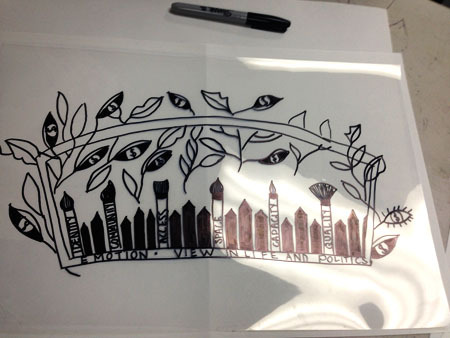 Additionally due to the timing of the workshop we took a meaningful look into how and when we create or support creation. 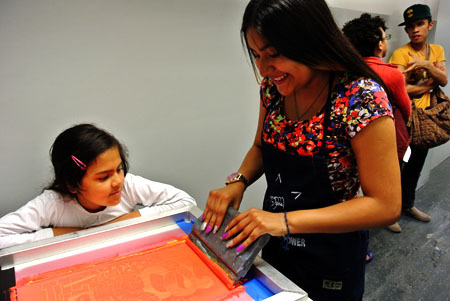 Combat Paper NJ and MPP presented a one-day screen printing and paper-making workshop exploring areas of overlap between the two groups' concerns, including the experiences of an undocumented person serving in the armed forces and military recruitment in high schools. 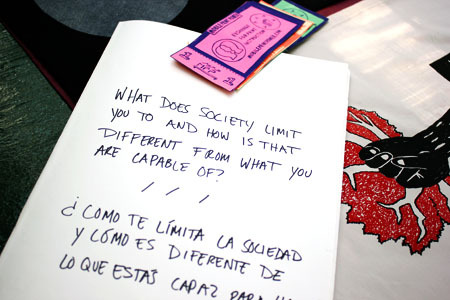 The workshop started with a conversation around the question, "How do we create space for uncomfortable conversations?" 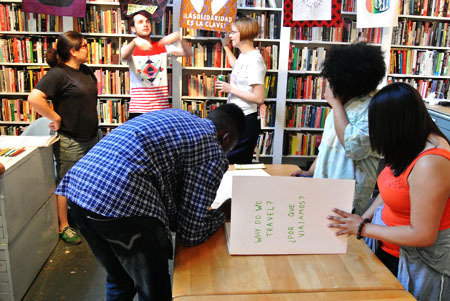 Working in groups, workshop participants created graphic images in response to this question. 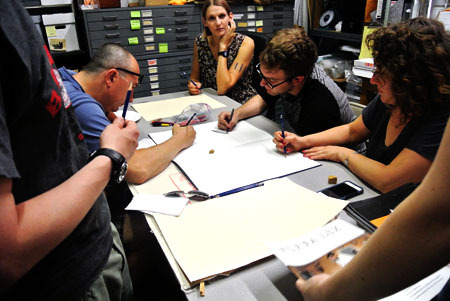 At the conclusion of the workshop the graphics were printed onto freshly pressed Combat Paper. 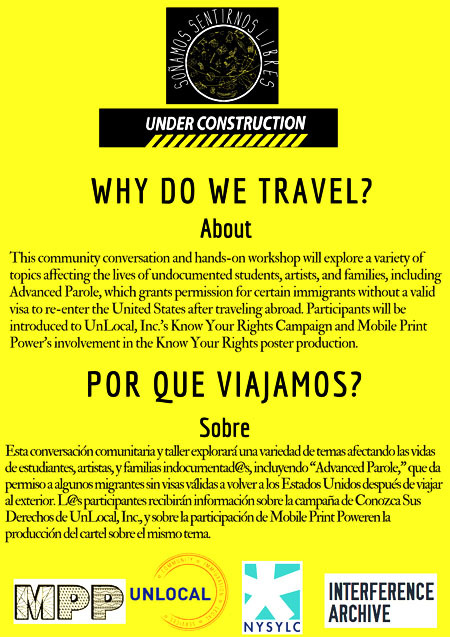 This community conversation and hands-on workshop explored a variety of topics affecting the lives of undocumented students, artists, and families, including Advanced Parole, which grants permission for certain immigrants without a valid visa to re-enter the United States after traveling abroad. 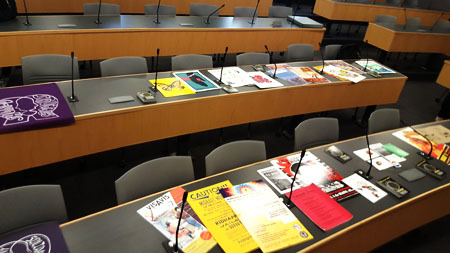 Participants were introduced to UnLocal's Know Your Rights Campaign and MPP's involvement in the Know Your Rights poster production. 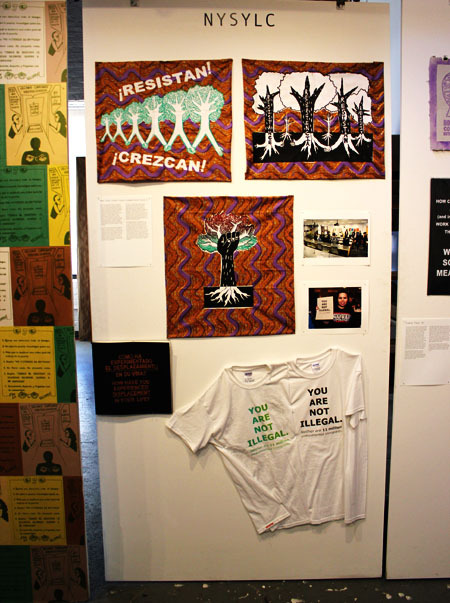 We also recapped the collaborative workshop that Interference Archive, MPP, and NYSYLC led at IYECon 2016, Drawing From the Archives: Liberation & Collaborative Design, and we printed images created during the IYECon workshop based on the conference theme, "Rooted in Liberation." 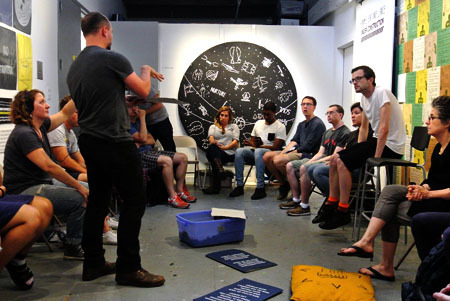 In this community conversation, we discussed different models of collaboration by describing our approaches to collaborative art production, sharing the ways that collaboration shapes our practices. 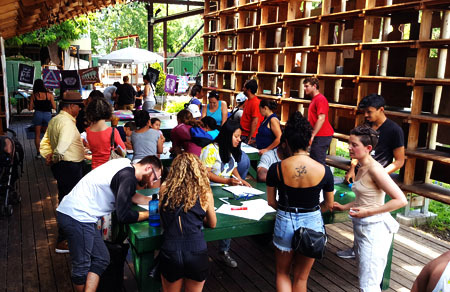 The conversation was guided by questions like "In systems that reward individual excellence, how can we create spaces and opportunities to support collaborative work?"" 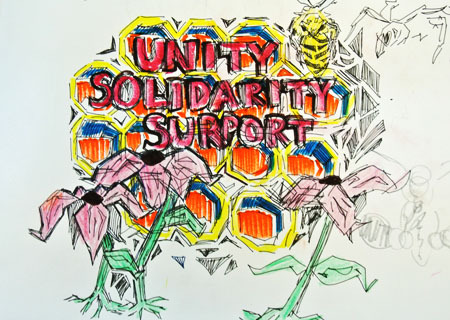 and, "How do these collaborative practices connect with our collective struggles for a more just society?" 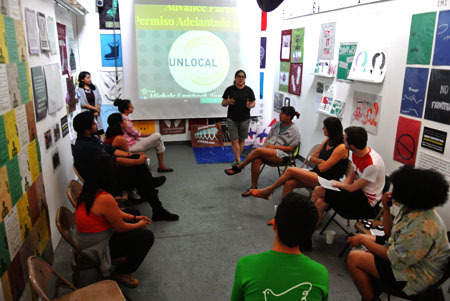 This event also included a screening of TIC's collaboratively-produced short film, Sí, Se Ha Vivido Bien (Yes, We Have Lived Well). 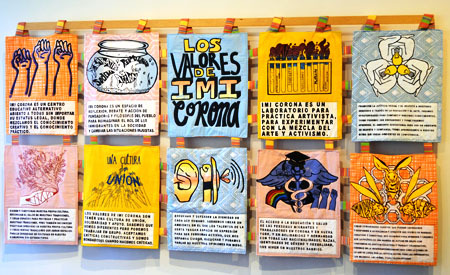 In 2014, the IMI Corona Community Council developed a series of values to guide the work and vision of IMI Corona. 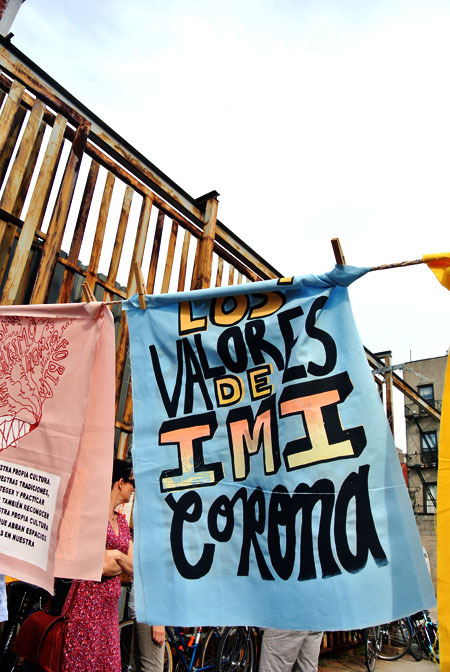 To support this work, we hosted a series of collaborative design and screen printing workshops at IMI Corona, inviting the larger IMI Corona community to turn the recently published values into a visual work. 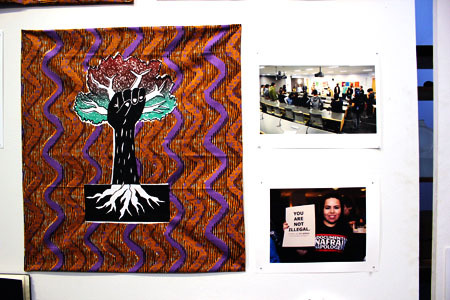 The final work developed in this collaboration (a large quilt created in collaboration with Mary Papsco) was permanently installed at IMI Corona in fall 2016. 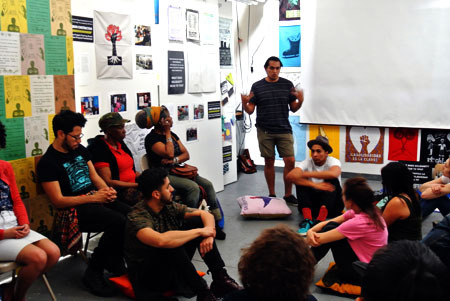 MPP and Interference Archive led a workshop exploring the relationship between art and social movements, and the role that collaboration can play in the creative process. 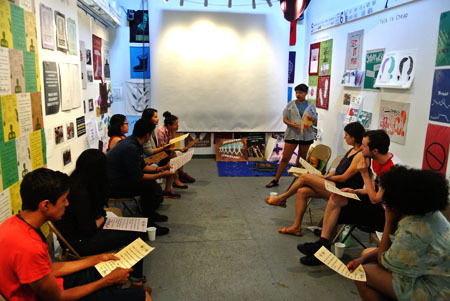 Participants looked at archival materials such as demonstration posters, pamphlets, books, and buttons from social movements specifically related to immigration and the experience of being undocumented. 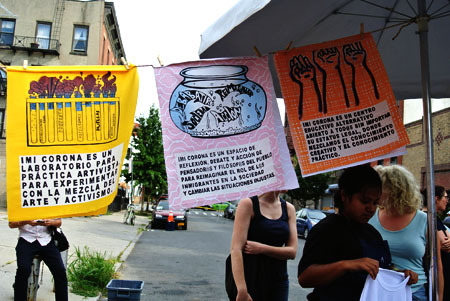 These materials represent social movements that support migrants in the United States, Canada, and Europe, offering a glimpse at the history of organizing to support the rights and livelihoods of migrant communities. 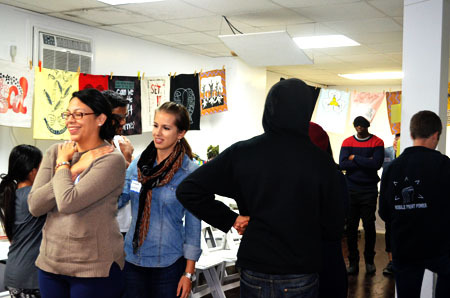 Participants will then learned about the process that we use to make collaborative designs and then created new graphics based on the conference themes of "Remember Our Roots, Fight for Liberation."